It is September 2017, and we have woken up again to a story that feels a tale of a century ago or longer back in time. Emily Lima, the first ever female coach of the Brazilian Women’s National Team (WNT) has been dismissed from her role; after only ten months of work, having started one of the most advanced programmes the Team has ever experienced. In a bold action of protest Cristiane, Brazil WNT legend is also retiring today. 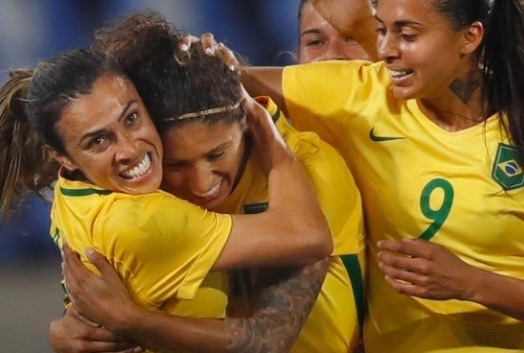 The Brazilian Football Association (CBF), is one of the most privileged in the globe in terms of talent; they have one of the biggest pools of male and female players, in a country where the love for football feels like religion. The potential does not stop on players, imagine the number of retired stars that could be leading the game at different levels? In the women’s game this is one of the saddest part of the story. Most of Brazilians former female players are not serving in their own country. Why is this still the case? Why in 2017 is not possible that women see themselves as leaders in their own game? I have personally met in Brazil so many former female players with great potential to lead. Unfortunately, they are not found among the leadership of the football organisations. I found myself being the only woman in the meeting-room, as I was representing FIFA. Throughout the years I worked on Women’s Football Development, I witnessed incredibly talented women being taken out their coaching-roles at national level. Regardless of their success, experience and knowledge, they would leave football, due to lack of opportunities or else they experienced the same fate as Emily Lima – those that follow women’s football closely know those names very well. So much talent to despair! I could never understand, nor accept, that gender determines how humans are assessed. In 2015, following a global survey FIFA introduced a leadership programme and a scholarship programme, for female coaches and leaders and more earmarked funding went to the women’s football development programmes-portfolio. The findings were clear: to advance the women’s game there was a strong call for more women on the side-lines and at the decision-making table. It showed that the number of female coaches in football is very low, with only 7% of registered coaches from the 177 associations that participated being female, while the results also demonstrated that successful member associations in women’s football have a higher level of participation of women at coaching levels. The success of female coaches has been highlighted across the history of the women’s game and witnessed by followers all over the world in the latest biggest tournaments. The FIFA Women’s World Cup 2015 and the UEFA Women’s European Championship in 2017 were both won by women. Since 2000 all major women’s competitions winners have been won by female-coached teams – except one. Lima’s dismissal shows once again the importance of having women sitting at the table and being able to have a voice on crucial decisions in their own sport. A key matter on improving governance in football is advancing the gender-parity agenda. How many women are there within the Association’s board? How many women are represented at technical structures? How many opportunities are they given to have a say in decisions that pertain their futures? How many women are considered to lead women’s teams let alone male teams? More than ever, global football governing bodies such as FIFA and the Confederations, need to take a leading role to support women in football. At the other end of the structure, National Associations have the duty to create the conditions for women to have a career in the game. They should have a supporting and mentoring system in place. More women in football is one of the key pillars of FIFA’s reforms and recently launched FIFA Forward Programme. All these initiates should be aligned with FIFA Women’s Task Force recommendations given during the FIFA reform process. As the guardians of the game, FIFA, the confederations and the National Associations need to stand as strong advocates. There is a need for concrete measures, building awareness and a truly inclusive environment. Situations like the one happening Brazil are no longer acceptable. It is time to show that words are meant to take the form of real actions.